Shockey Realty Company was established in 1970 to provide comprehensive commercial real estate services including property leasing and management, site acquisition, business park development, and new build-to-suit projects. Shockey currently owns and/or manages more than four million square feet of prime commercial space in Virginia and West Virginia. Shockey works closely with broad range of site location advisors, relocation consultants, commercial real estate brokers, economic development officials, and a host of national and multi-national companies. The company’s first building, constructed solely to lease, was constructed in 1970 in the Fort Collier Industrial Park in Winchester, Virginia. Shockey has since constructed over one million square feet of new precast and tilt-up concrete buildings for lease in that market. In 2003, Shockey purchased the former Corning Glass and World Kitchen manufacturing property in southern Berkeley County, West Virginia and repurposed it for a multi-tenant facility that houses manufacturing, distribution, office and retail tenants. The property, named Berkeley Business Park, includes plans to develop 30 acres that borders Winchester & Western Railroad. 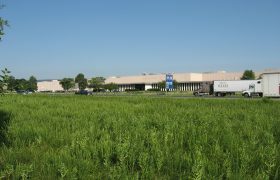 A few years later, Shockey purchased the former General Motors Distribution Center, also in Berkeley County. With two million square feet under one roof, that property now serves as a multi-tenant distribution/warehouse facility. Named Shockey Commerce Center, this property covers over 226 acres, and there are plans to develop a new 100,000 square foot building and a new 200,000 square foot facility. Shockey Realty is affiliated with The Shockey Companies, a group of companies that offers diversified real estate and construction services.